Form building and management may not be the biggest programming challenges; however, if you’ve been there, you surely know this poses problems. It requires server database administration, form debugging can be tricky and the whole job is, above all, really time-consuming. At a certain level, a developer may not want to deal with too much coding when the job of building forms becomes a routine that can be handled by a remotely hosted form generator. However, we all feel the need to adapt the code at some point and one may not be content with “pre-packaged food”. The conclusion is simple. The anatomy of a modern form generator is a hybrid – its WYSIWYG interface allows the user to create a form in minutes, whereas additional capabilities provide the means for making changes to the code. Our case study for this article is 123ContactForm, a web form builder that offers enterprise-ready solutions that join these two seemingly contrasting features – intuitive GUI and coding flexibility. Wtih 123ContactForm, the entire form building process is plain simple: edit the form, adjust its settings and publish it on any website or social platform. The service grants access to dedicated servers for storing form submissions and centralizes them in the user’s control panel, from where customized charts and reports can be accessed. Programming pains are gone and you are still in full control over the form code. 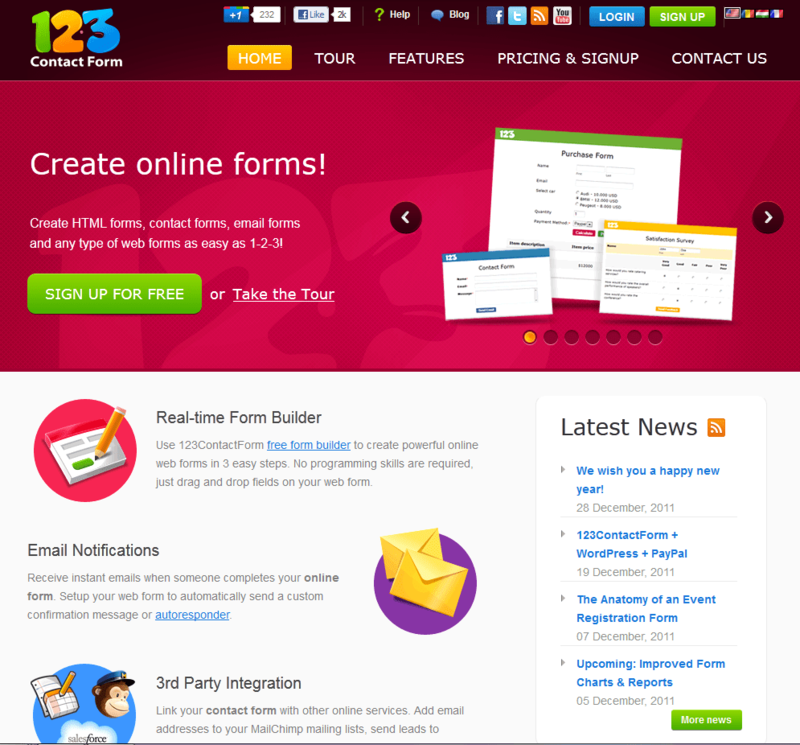 Let’s have a tour of the features provided by 123ContactForm. 30 niched templates found in the templates collection. Any of these can be further customized. After choosing the preferred starting point, users are taken to the real-time form editor, where form fields function on a drag & drop basis and the intended structure and layout are very easy to shape. The user has access to 20 basic, advanced and special predefined fields and label content and style are fully customizable. Field validation can be set or changed with one click. The next step is changing form settings. In this section, users can add – with no coding skills – features that would otherwise require a lot of programming effort. They can customize autoresponders and notifications (multiple recipients available), style the form in a theme gallery, activate security options (CAPTCHA and smart CAPTCHA, password protection, SSL data encryption), apply rules over fields (branching and conditional logic). Payments can be received through forms, as 123ContactForm integrates with three major processors: PayPal, Authorize.Net and Google Wallet. Form usability can be extended with various 3rd party applications: SalesForce, MailChimp, VerticalResponse, iContact, TopProducer, Google and Yahoo groups. 2. HTML blocks in the WYSIWYG editor. 3. 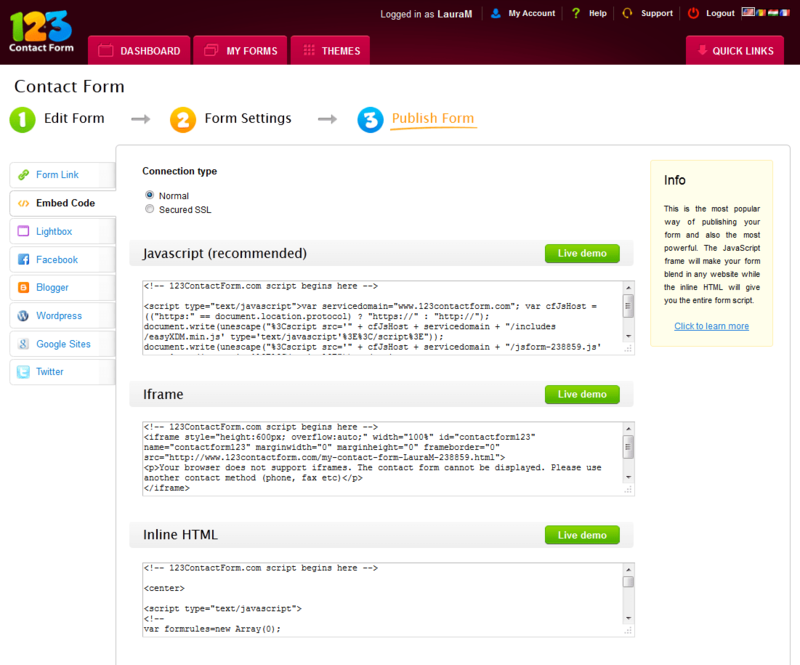 The Inline HTML section, that provides the full code and allows for any changes. One more proof that “enterprise-ready” does not mean thinking inside the box. But rather the opposite. Written by Laura Moisei – brand manager at 123 Contact Form. A WordPress enthousiast and a casual photographer, she likes to keep in touch with the latest tech news and spread the word around.